Staying organized is critical, especially when you have thousands of documents and creating a filing structure coupled with consistent file naming in such cases can be challenging especially with a multi-user system. Docsvault allows a very flexible Filing Template that can generate a Filing Structure with consistent File and Folder names based on corresponding index values entered for the document/s being imported. Now, users can relax about where to put documents when they're importing it. Filing template can also generate file & folder descriptions and notes automatically based on the Profile values entered. Filing Templates help you maintain a consistent filing and naming policy of files and folders. As documents are imported into Docsvault, they can be automatically filed and named based on index values entered by users. The filing template can be used whenever you manually import files or folders into Docsvault. For instance, filing document from different projects in their own respective folders say, Work Contract for Project Bell. With Filing Template, you can index the documents by both attributes (Project Bell, Work Contract), making a rule to dynamically create a folder project-wise (Project Bell) if not created and import Work Contract document into it. •In Profile dialog, click Filing template button. •Dynamic Location: You can use Dynamic Fields from the 'Dynamic Values..' drop down list box on the right. •Define File name, description and notes. You might consider including some of the following information, but you can include any other information that will allow you to distinguish your files from one another. ▪Original Filename: You can use the original filename as part of a naming option. The dynamic values once assigned during the import process will prevent further editing of the file name, description and notes. •Click Save to save the Filing template. •When the specified Base location does not allow saving files due to folder restrictions set at cabinet level, you must either remove the restrictions at the base location or specify at least one mandatory index field for the dynamic location. 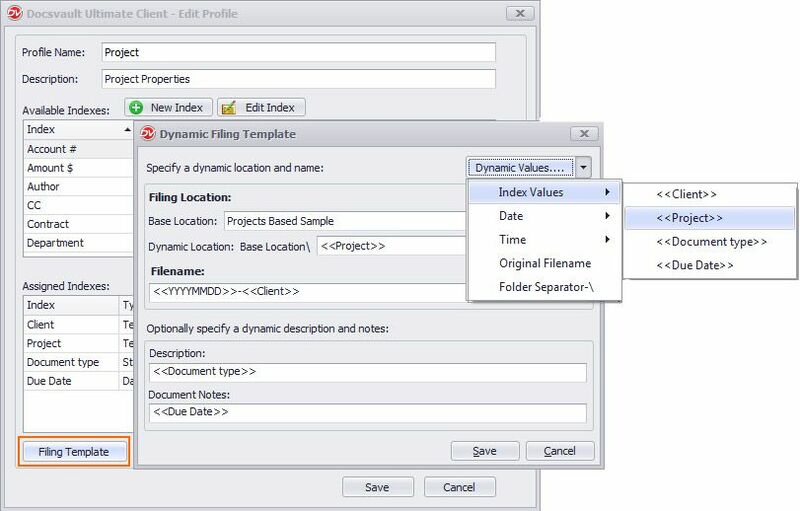 The system will create the entire folder structures corresponding to restricted folder template and auto file the files in the dynamic location specified. When a Filing Template is configured for the Document Profile, users can send files to the appropriate folder automatically. Note: If Filing Template has not been configured for the document profile, you will not be able to use the instructions below to auto-file the document. •After Filing Template has been applied to any profile, Auto filing option would be enabled. •On choosing Auto option, all the profiles with Filing Template configured would be available for selection in the drop-down list. •As in the image below, when a user assigns profile to a file, the index values being entered can be used to dynamically create a folder and include the index values in the file name, description and notes. Users can also drag & drop files in the drop zone for auto filing. This zone is only available if any one of the profile is configured with a filing template. •For General which is a default profile, you can only set file-naming, description and notes based on the index values. Auto Filing can't be configured in case of General profile.